As the end of the academic year workload eases I eventually have a bit more time to immerse myself in the final section of the Masters. I have had to make some major decisions in the past few days as I have so many ideas and different facets to my work I need to decide which area I wish to develop. The important areas to me are; painting on canvas, digital drawings, dyeing silk, painting on paper. The canvas paintings I did at Easter have remained untouched due to lack of studio space and a sense of doubt about their quality. This week I stretched the first one to see if it would change how I felt about it. I thought I would be pleased and excited by it when I saw it all tidily stretched but actually I was a bit disappointed and rather underwhelmed. This really panicked me and made me question why I was painting onto canvas, I felt a strong need to reassess what I have been doing. I am continuing to enjoy experimenting with digital drawings. Some good news is that I have managed to aquire an ipad on loan for a few weeks. This will enable me to experiment with the drawing app on a larger scale which hopefully will result in something new. Most recently I have been inspired and exited by the use of fluorescent dyes. Throughout my investigations colour has been of utmost importance to my practice, it has been employed in my attempts to capture the luminocity of light and drama of nature seen through meteorological events I witness in my chosen landscape. The powerful impact and intensity of the fluorescent colour is joyous to me, I revel in exploring how it interacts with the dyes, particularly when bleeding together. I can see possibilities to push boundaries with concept of such unnatural colour inspiring the natural landscape. 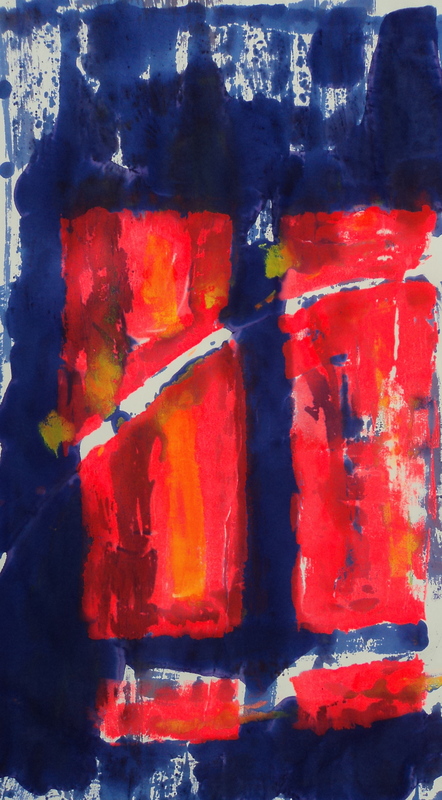 I am interested in contrasting and complimentary colour evoking abstract concepts of atmosphere and light. To work with these ideas on a larger scale using fabric I can manipulate manually inspires me in a way that the canvas does not. I have begun to examine how the fluorescent medium reacts on the silk and with the dyes. To my delight I discovered that as the fluorescent media lies on the surface of the fabric so when it dries it resists the procion dye which penetrate the fibres fully. I found out the strength of colour could be manipulated, producing different effects applying wet on wet, wet on dry or wet on partially dry. I manipulated the application of media by both unpredictable dip dying and more controllable direct painting methods. 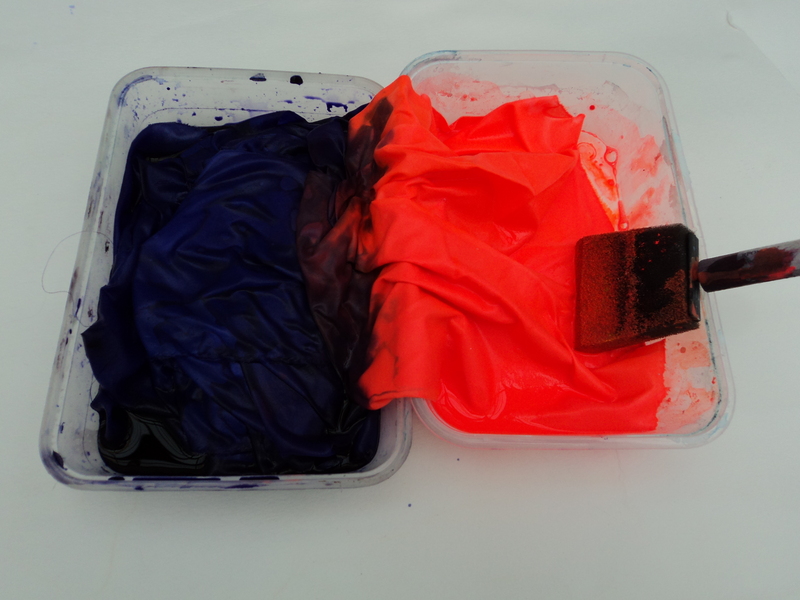 Fluorescent pigment dye applied over procion dye with areas of discharge. 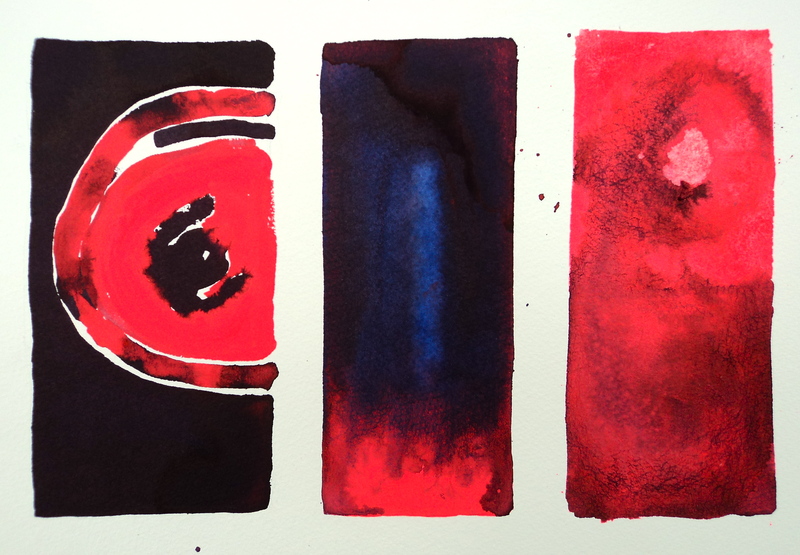 A pleasant side effect of the process is achieved as the dye bleeds through onto the blotting paper it is laid on. 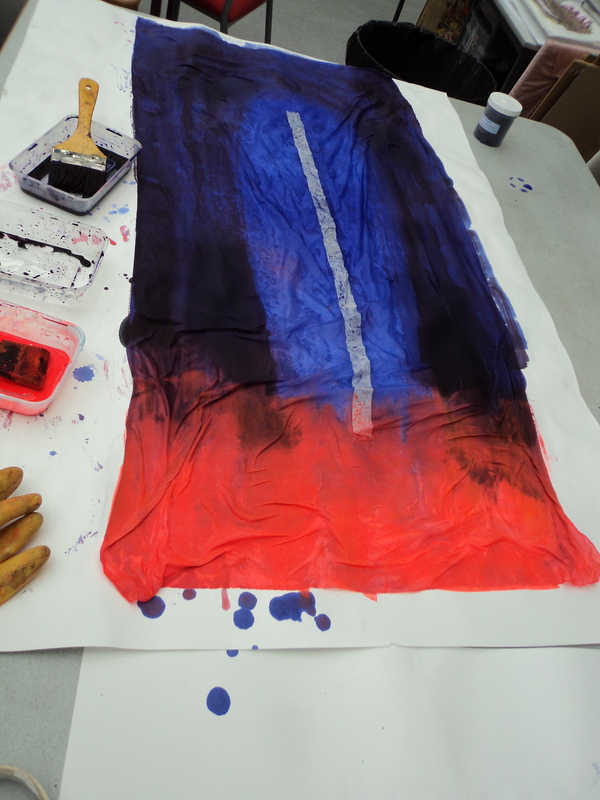 Blotting paper placed underneath silk while applying dyes. So I am confident that this is the way forward for me, it feels right, I am excited and inspired by these processes and materials. I think that it is unique to me and I am on the verge of developing this as a personal style that I feel an intense connection with. 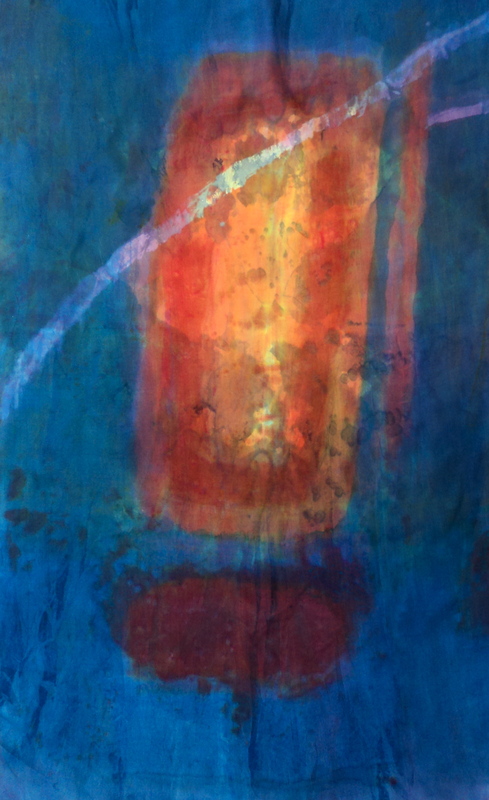 This entry was posted in Practice and tagged abstract, Abstract art, art, Canvas, Dye, dyes, Dyes and Pigments, Experiment, expressive, fine art, Fluorescence, glow, ideas, landscape, light, Paint, painting, silk, Techniques and Styles, textiles, Visual Arts. Bookmark the permalink. I love both results that you have achieved from this experiment. 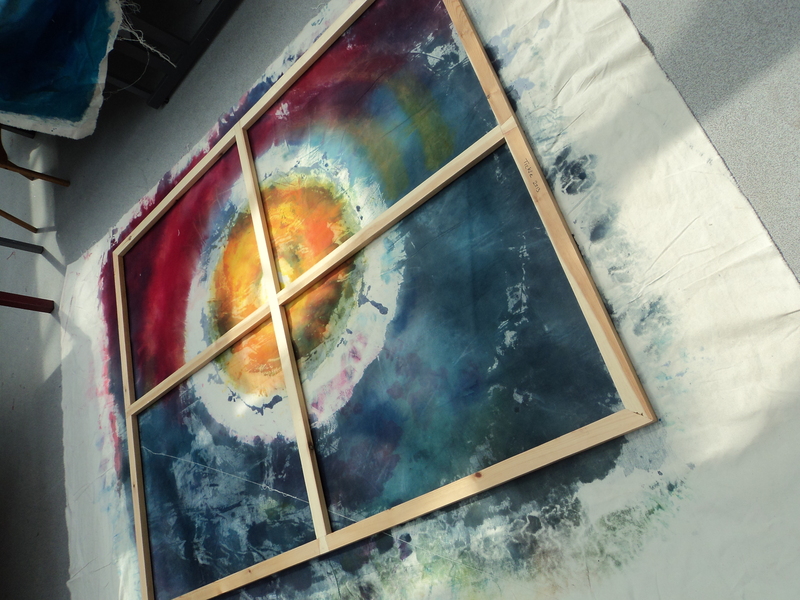 The dye on silk is beautiful, and has a lovely luminosity and the print which you took on blotting paper was a great idea with a much looser effect. Very inspirational! Stunning! This is the way to go to capture the light.